So, remember when I was all like "I'm going to reread more books!"? Yeah. I don't always have time for that. LUCKILY (kind of? I guess? ), I have a somewhat decent commute to my job. And what better to do during a commute than listen to audiobooks? I've been revisiting some of my favorites on audio and I've got two to share with you today. 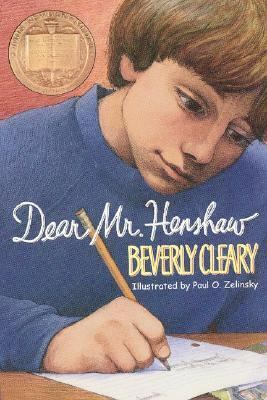 Dear Mr. Henshaw by Beverly Cleary. Audiobook produced by Recorded Books, narrated by George Guidall. Grades 4-6. Copy provided by my local library. It all started when Leigh Botts had to write a letter to his favorite author as a class assignment in the 2nd grade. He picked Mr. Henshaw. The following year, he again had to write to an author and he, again, wrote to Mr. Henshaw. By the time Leigh was in the sixth grade, he considered himself Mr. Henshaw's number one fan. And as Leigh started to go through some things in his own life (like starting a new school and dealing with his parents' divorce), he wrote to Mr. Henshaw. For me, this book definitely stands the test of time. I loved it when I was in grade school (probably because I loved reading and writing and the idea of having a dialog with a famous author really appealed to me). And now that I go back to it, I can appreciate how real a character Leigh Botts is. He complains when Mr. Henshaw replies to his list of questions with not only a list of smartypants answers but a list of questions for Leigh to complete (how Ms. Cleary must have laughed to write that part!). Leigh's facing a situation that many kids face - his parents' divorce. Even though this book was written in 1983, I think it stands up remarkably well. It doesn't really feel dated at all. The audiobook narrator, George Guidall, does a terrific job as well. The story is told exclusively through Leigh's letters to Mr. Henshaw and Leigh's journal, so there aren't really characters to voice. The recording doesn't have a lot of bells and whistles, but it doesn't need them. It's great as it is. If you haven't read this one, pick it up or grab the audiobook. It's definitely one of my all-time favorites. 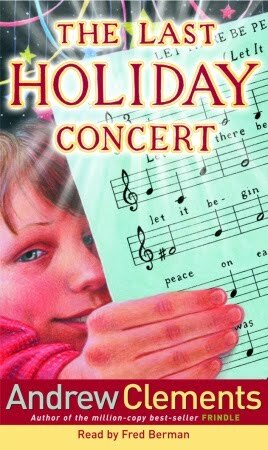 The Last Holiday Concert by Andrew Clements. Audiobook produced by Listening Library, narrated by Fred Berman. Grades 3-6. Copy provided by my local library. Hart Evans is a sixth grade golden boy. Mr. Meinert is the sixth grade chorus teacher, recently RIFed (laid off - Reduction In Force-ed). They don't have a thing in common. When Hart misbehaves in chorus, Mr. Meinert explodes. He can't believe that none of the sixth graders understand what a big deal the holiday concert is! So he leaves it up to them. He bows out as director and the kids elect Hart. Can the sixth graders put together a holiday concert? Will their concert be a masterpiece or a mishmash of weird talent show acts? Andrew Clements creates accessible school stories and I love that you get some of the teacher's perspective, too. School RIFs are a reality for students and it's good for them to see it from the teacher's viewpoint, too. In this book, I particularly love Clements's description of the concert. It brought tears to my eyes when I read it and it brought tears again when I listened to it. Narrator Fred Berman brings all the characters to life, creating distinct voices for Hart and Mr. Meinert. His dramatic reading of the concert scene really added to how moving it was. Don't forget to submit your audio reviews to Kelly at Stacked for the April AudioSynced Roundup!